There are so many things to do in Hydra, Greece and the endless opportunities are perfect for so many different types of travelers. 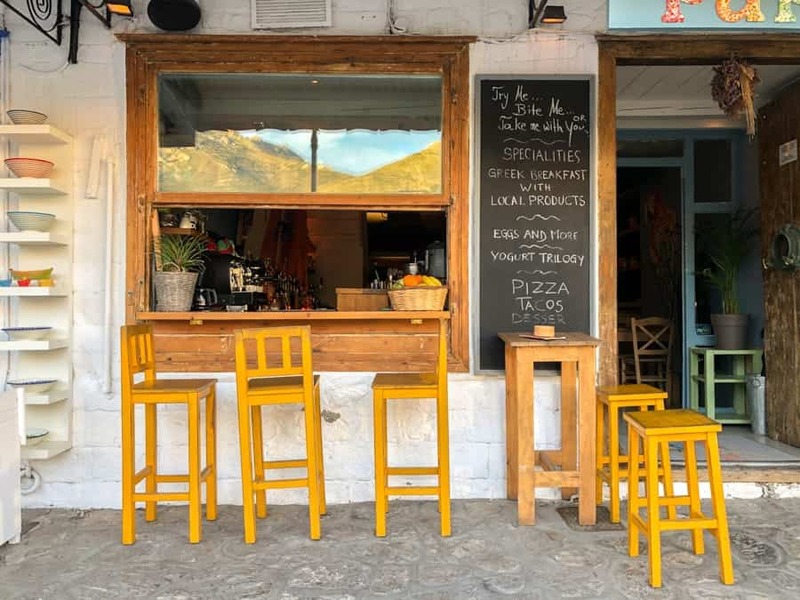 This is a guide of what to do in Hydra – from restaurants serving amazing, traditional Greek food to some of the best spots to catch a killer sunset and beyond. I hope you fall in love with Hydra Island just as much as I did when there! It ended up being my favorite place I visited on my last trip! 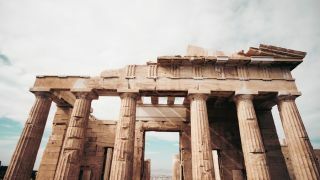 Want Even More Greece Inspiration!? 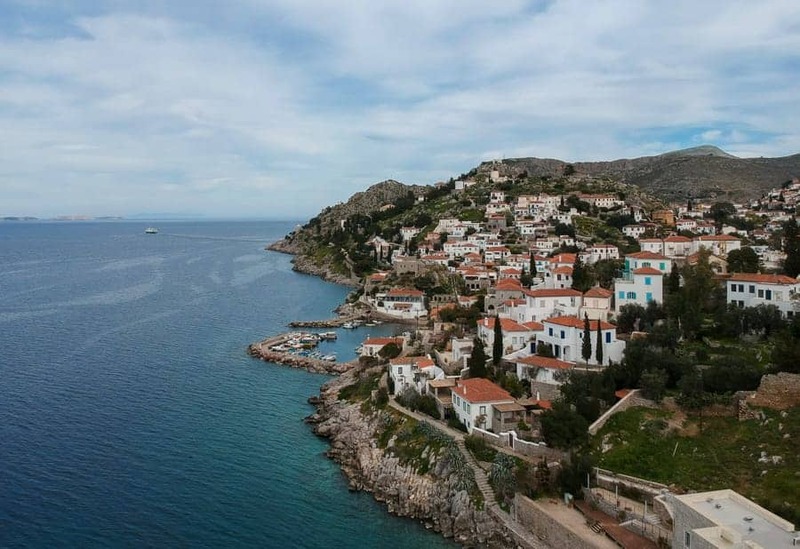 The island of Hydra is a gem just off the coast of mainland Greece. The idyllic island is free of cars, apart from the occasional car bought on to the island for trash removal or to bring on building equipment in the offseason. 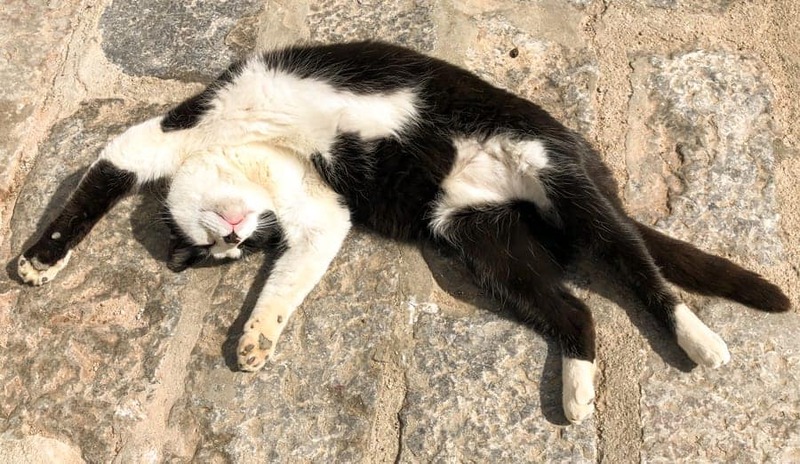 It is known for its enthralling history and gorgeous port that is surrounded by relaxing cafes and hungry cats awaiting their next meal from the local fisherman. Once you have arrived at the dramatic and rugged island, you will instantly be taken aback by the white, orange-roofed houses climbing up the slopes of the hill. 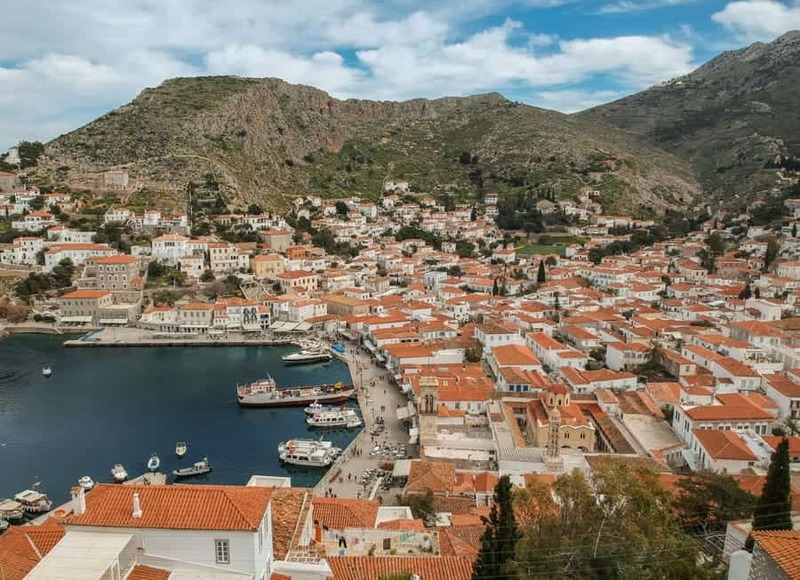 Hydra isn’t an island that is off the tourist track; in fact, during the high season, the island has foot traffic of around 10,000 visitors a day or so. 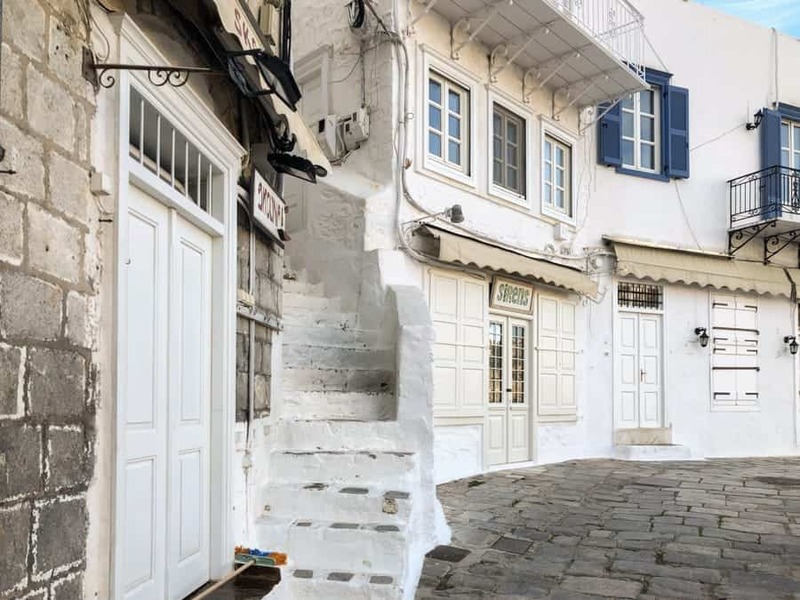 The visitors primarily come in via cruise ships and merely spend a few hours walking the quaint streets of the island and checking out the old canon bastions that defended the island during the Greek War of Independence. 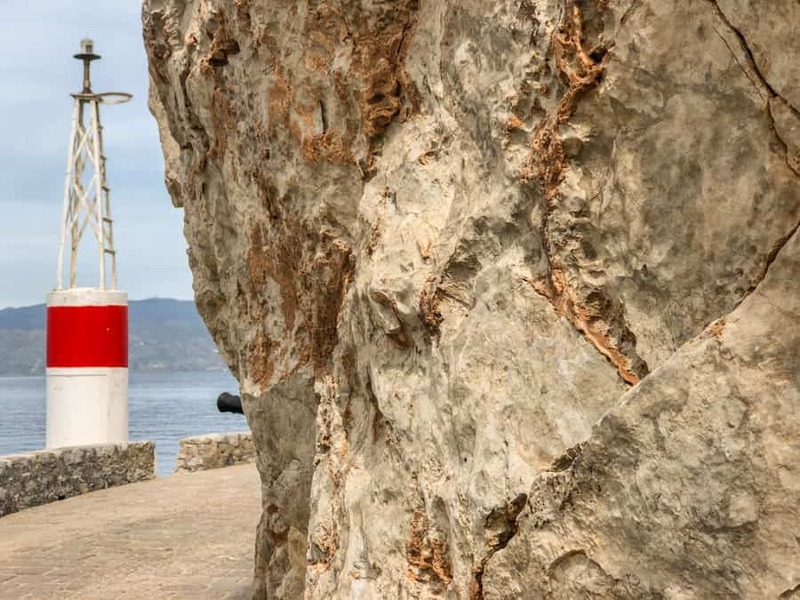 Most of the main sights on Hydra are found within close proximity, making it an ideal stop for a cruise. 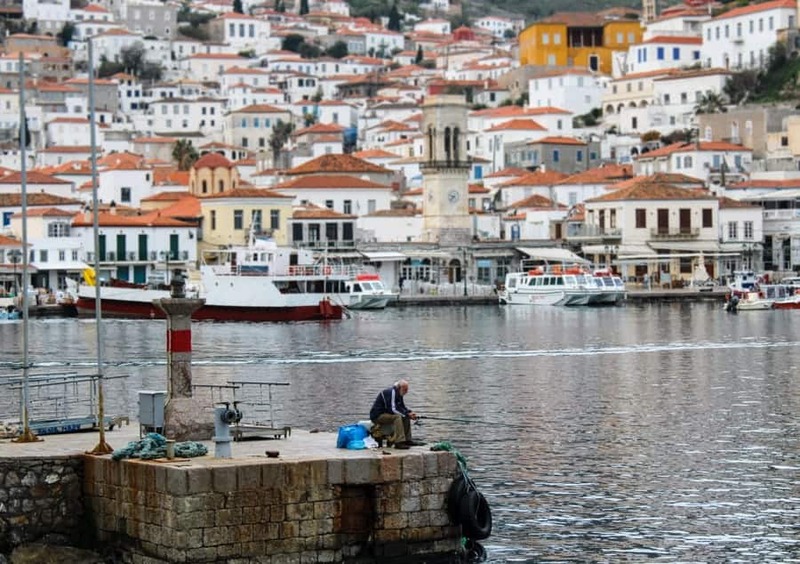 Despite this being a common port for tourists, it doesn’t mean that you can’t find peace and solitude on Hydra. I spent two days on Hydra recently and the island relaxed me far more than some of its quieter Saronic sisters. 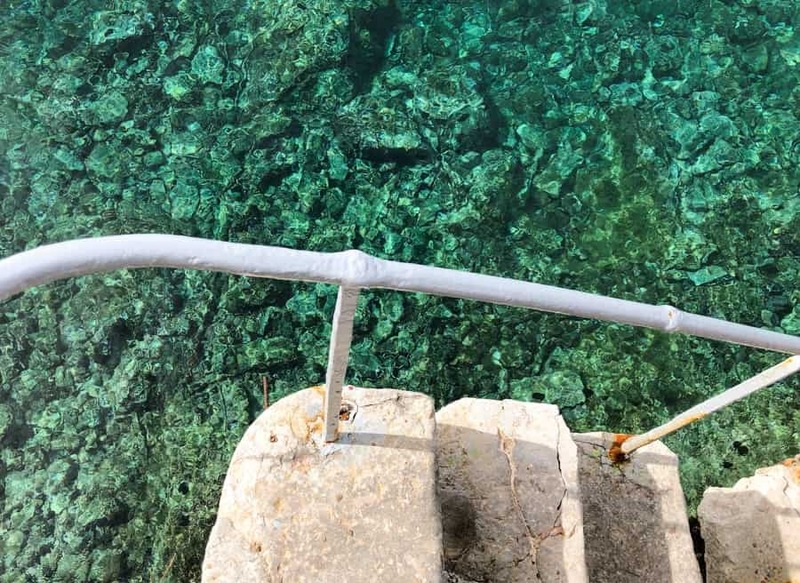 This is a guide of what to do on Hydra- or at least some of the best things that I did when I was visiting Hydra. 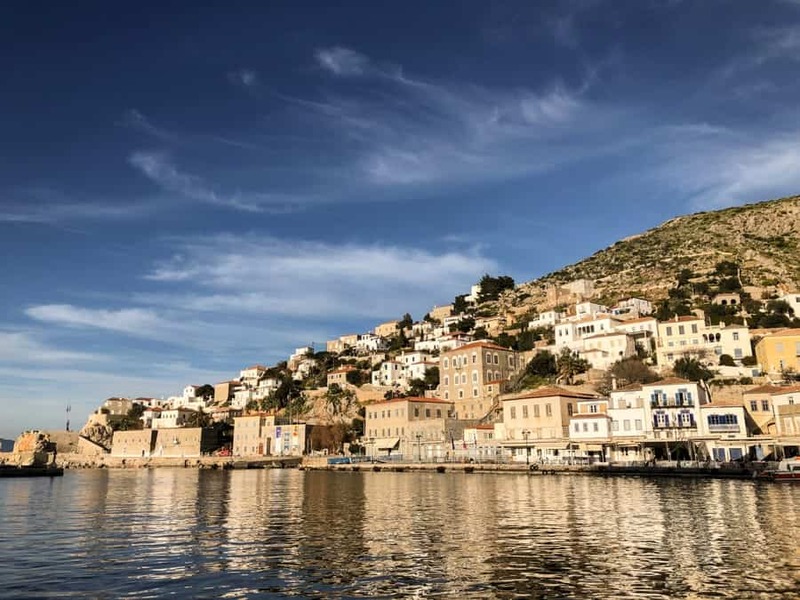 Getting to Hydra from Athens is relatively easy as there are several ferry services departing from Piraeus, with the FlyingDolphin and FlyingCat ferries both being options. The journey takes on average an hour and 40 minutes. I actually arrived from the island of Spetses but took the ferry back to Piraeus as Hydra was the last stop on my travels through the Greek Saronic Islands this time around. You can easily book Greek Island ferries via this website. The tickets cannot be printed out and will not be sent to you so you must pick the tickets up from one of the locations that are listed on the site when you book your ticket. Some of the locations may charge you a pickup fee of around €1. However, if you go to the Blue Star Ferries office right by the dock, you will be able to pick up your tickets free of charge. The cost of the ferry between Piraeus and Hydra is €28. The ferry port in Hydra is centrally located in the middle of the town and most hotels are within a quick walk of the harbor so transporting your luggage to your hotel should be an easy feat. 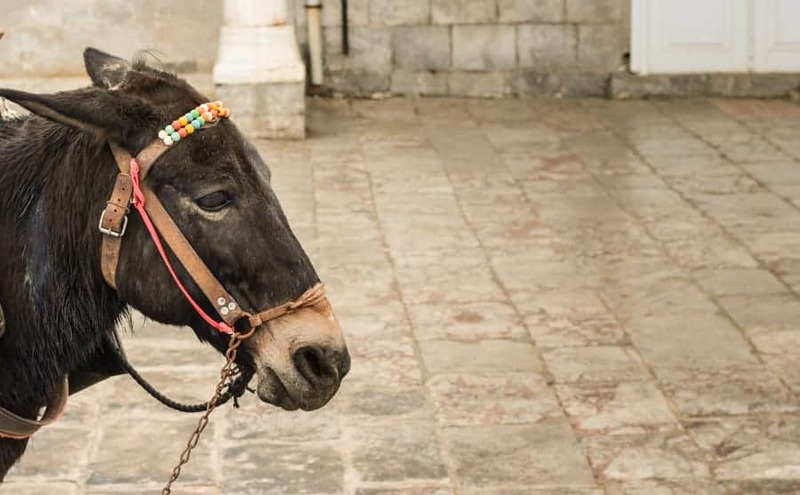 However, if your hotel is located further back inside the town, you will most likely have to hire one of the numerous donkeys to transport your belongings if you’re not keen on walking. I am not a big fan of riding animals or having them carry my stuff, to be honest. 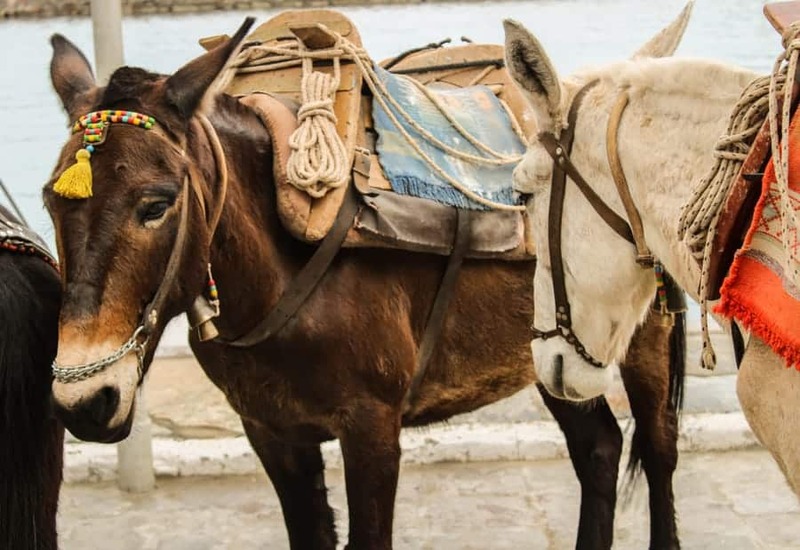 There are no cars, taxis, scooters, or motorized vehicles of any sort on the island so donkeys are pretty much the only mode of transport available for moving heavier things. I’ll let you do with that what you want. I, personally, suggest transporting your stuff by foot and booking somewhere centrally located. If you book a hotel in one of the smaller towns, you can arrange transportation with your hotel from the ferry port. 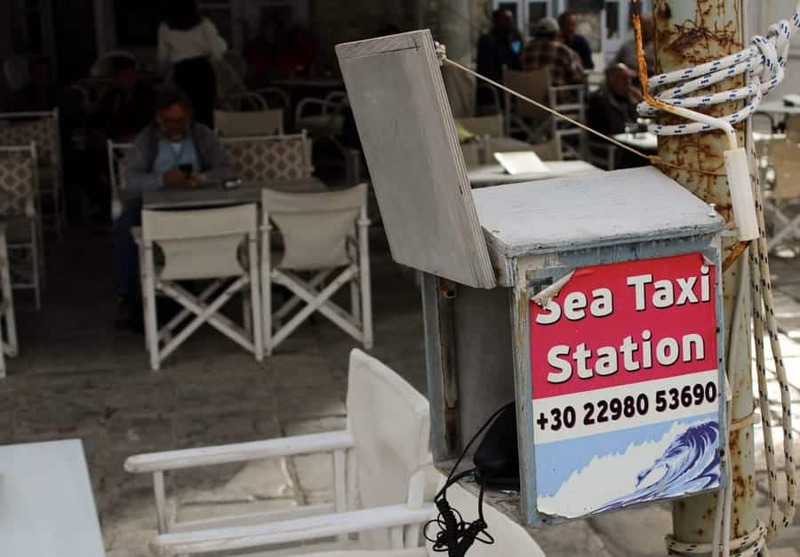 Outside of the Corner Café is the Hydra water taxi stand with a public telephone to order a taxi if there is not one at the stand. You can use the water taxis to reach the various beaches along the coast as well as the different little villages on Hydra. If you are going to a more remote beach, you should order a taxi to pick you up before heading to the beach as there are no phones at the more remote beaches to order one back. Also, be aware that the fares are set by an association so they are based on the number of people on the boat and the destination. If there are two groups of people on the boat, make sure the taxi driver does not try to double charge. I am not sure I will ever experience a place on earth where there are so many cats. 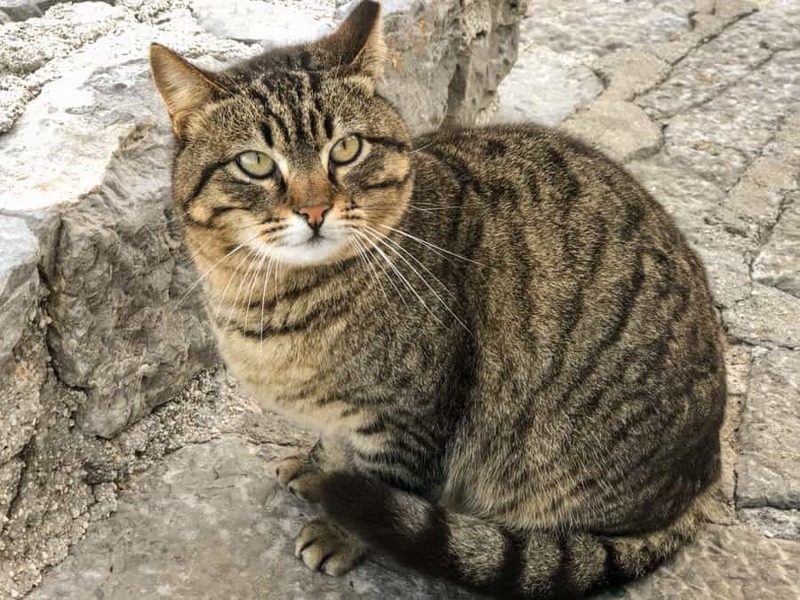 The island is literally teeming with felines no matter where you venture off to. If you try and eat a meal outside, there will likely be at least two cats vying for your attention (and your food). 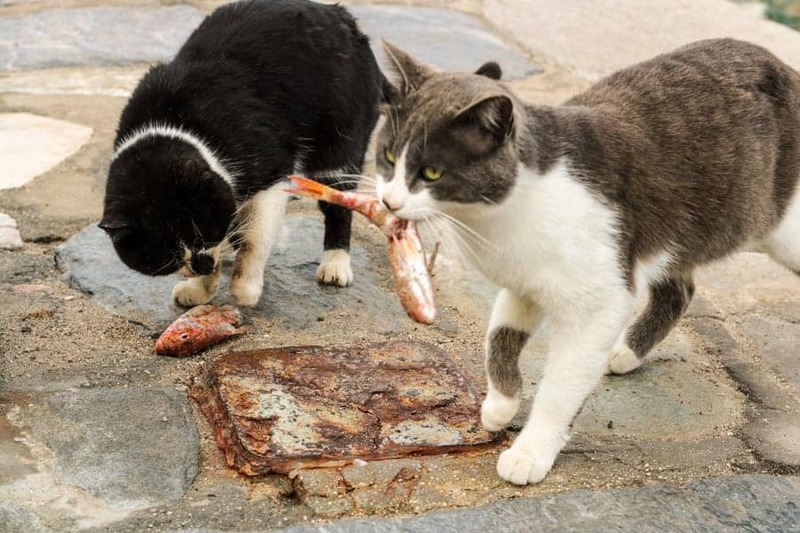 The animal charity HydraArk takes care of the cats ensuring that they are parasite-free and trying to control the breeding through sterilization so the population doesn’t become too uncontrollable. There are also plenty of dogs on the island running around but they all seemed to have collars so I am not sure if they are strays or not. Some of them run amuck so they very well could be strays. 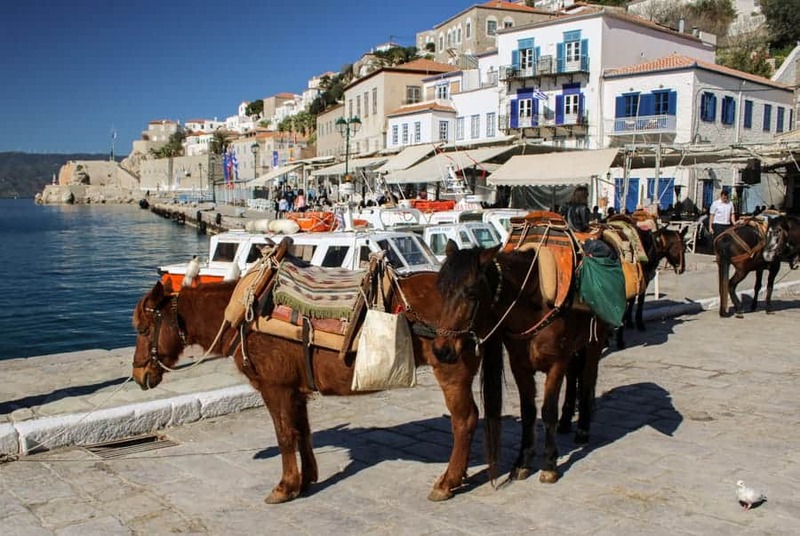 As well as these animals, there are the aforementioned donkeys who are the working animals on Hydra Island and there is no shortage of them with a population of over 1000 donkeys living on Hydra. Within the town, there are plenty of little supermarkets that are open daily. This is perfect if you have managed to secure a place to stay with a kitchen. You will be able to buy all the ingredients to make a perfect dish with the fresh fish landed that morning. 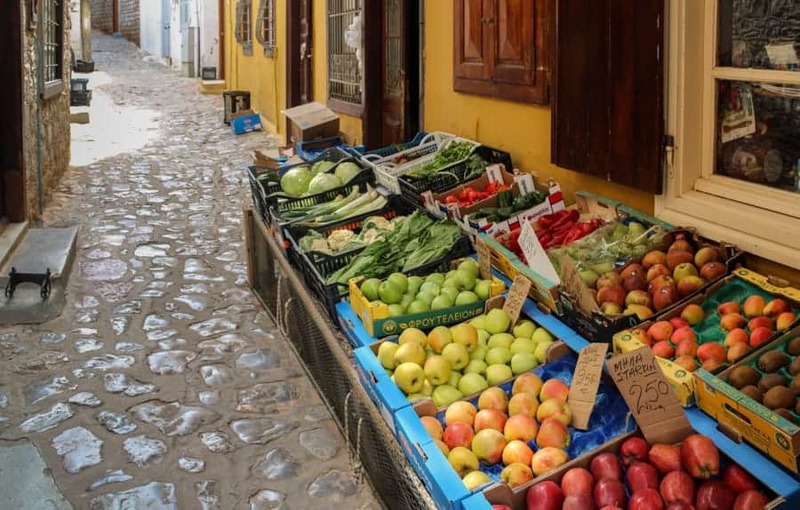 As everything on Hydra has to be bought on by boat, you will find things a little more expensive than mainland Greece but the prices are still very affordable. There are plenty of bakeries around that sell freshly baked goods. Most places accept all major credit cards, including shops and cafes. However, if you are wanting cash, there are multiple banks along the harbor with 24-hour ATMs and cash machines. 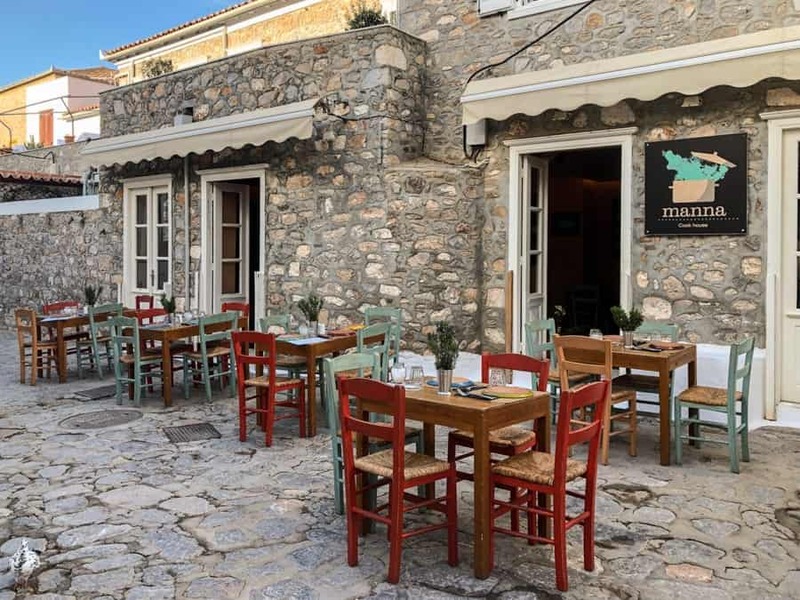 Around the central harbor in Hydra, you will find plenty of cafes and restaurants. 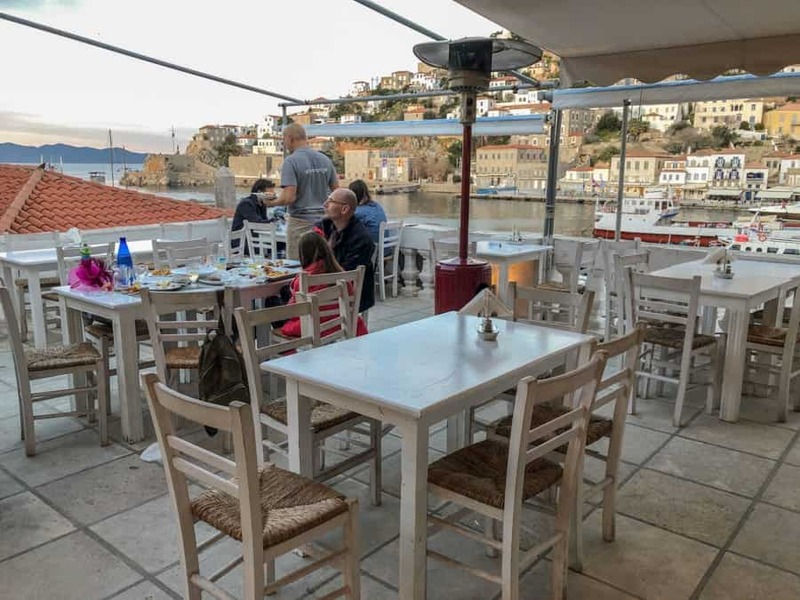 Toward the ferry drop off points, there are several cafes which are perfect for people watching as you escape the midday Greek sun. 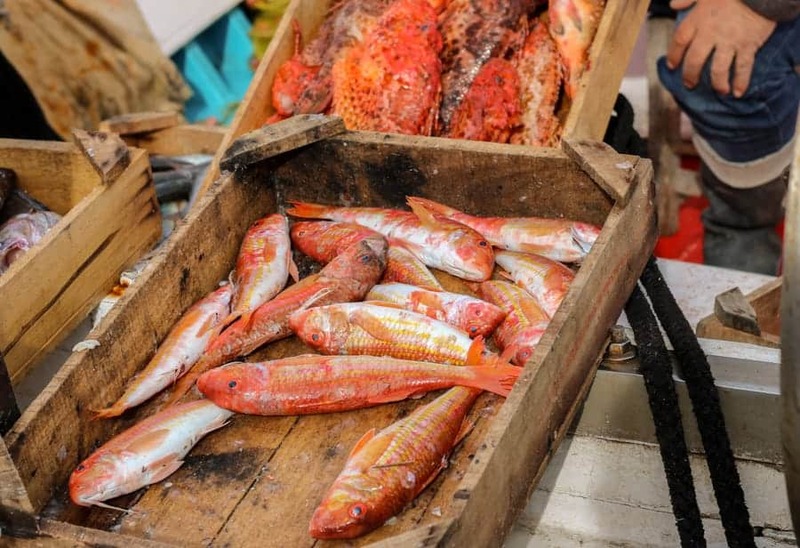 It is important to note that if you are after fresh seafood, then you will need to head to an actual restaurant (lesson learned on this although the cafes won’t try to deceive you). The cafés will offer seafood but it is usually frozen. Just thoroughly read the menu and if you see an asterisk by something, be sure to read the footnote. 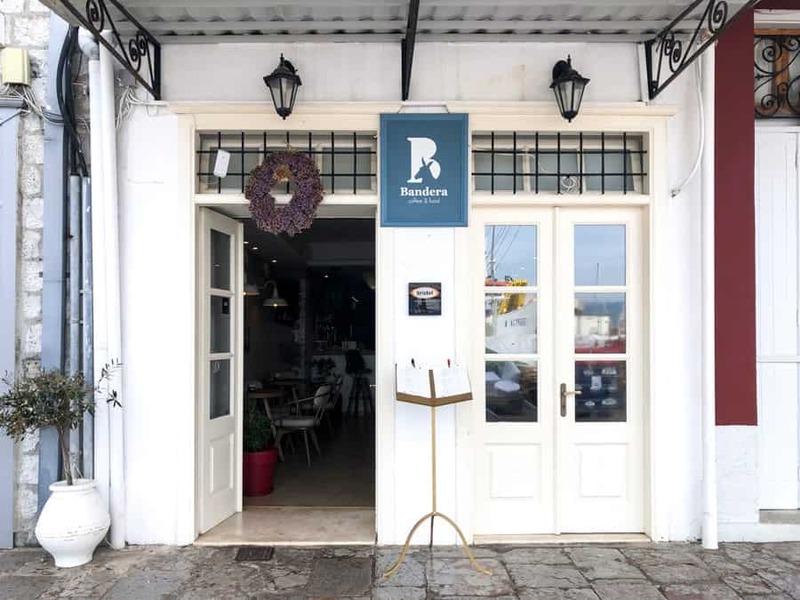 O Raia was my favorite restaurant during my short trip to Hydra and I managed to enjoy both their lunch and dinner service. Their seafood menu is forever changing and you need to ask what is fresh that day. The chef takes a lot of pride in the fish he serves and goes to select the fish to serve from that day’s catch. In addition, he will only purchase fish that is of the highest quality. I tried ordering something they were supposed to have that day and it turns out the last portion wasn’t to his standards so he refused to serve it. In the end, I enjoyed the fresh grilled mackerel and it blew my mind with its flavor and complexity. I also ordered fried fish and the most amazing taramasalata, a zesty dish made from fish roe. The portions at O Raia are incredibly large and it is really easy to over order (raises hand). 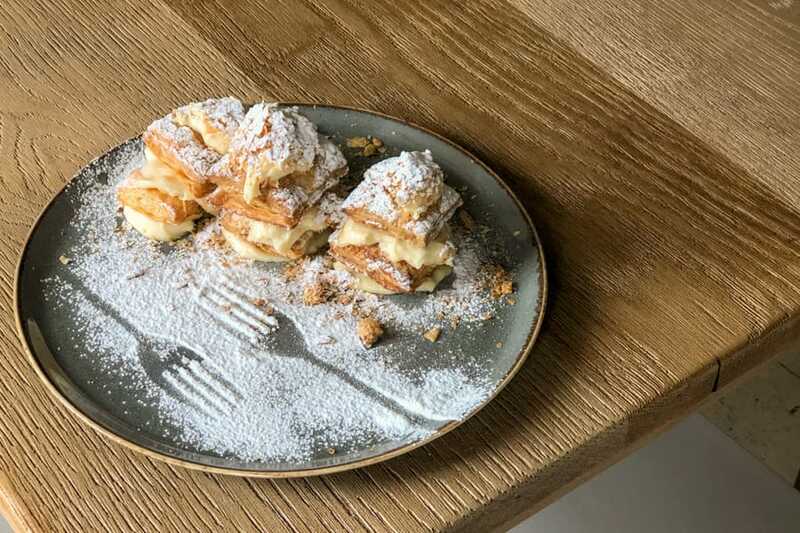 On weekends, the Hydra restaurant is often booked to capacity and you may find that it is not possible to get a table- so try and book ahead. The price is very fair considering its central location on Hydra. Because I went to Hydra during the offseason, there were not so many restaurants open, so my choice was limited. 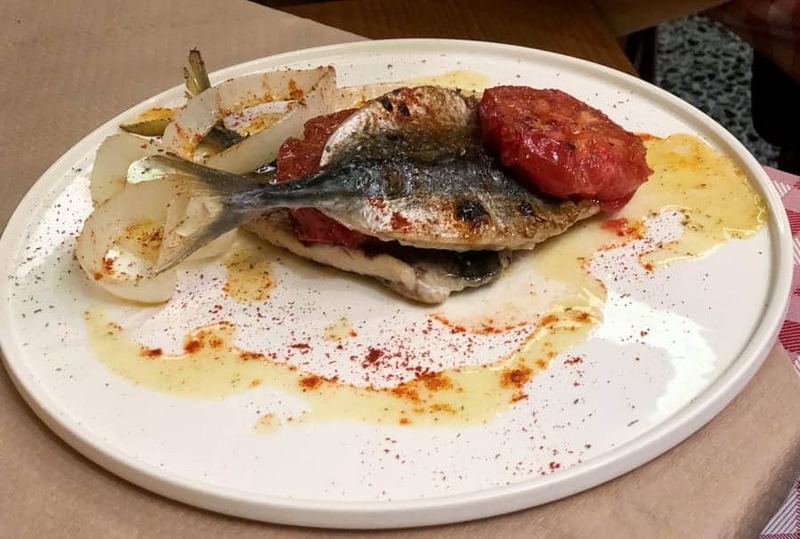 On my second night, I tried to go back to O Raia as I knew the food was of a high standard and fresh but they were booked to full capacity and suggested I try Psarpoula. Listening to their recommendation, I headed over to the restaurant that is located on the right side of the harbor if you are looking inland. You can find it on the rooftop of a bakery. The restaurant has an amazing rooftop terrace that overlooks the harbor and provides an incredible setting for a meal. They have a large selection of seafood dishes as well as traditional Greek meze dishes. I opted for the fresh squid risotto and it was rich and delicious (can I just move to Greece and eat non-stop?!). The restaurant is large and has indoor and outdoor seating- but I imagine that it fills to capacity during summer months. The prices there seemed a little on the higher side compared to O Raia but the food was equally as tasty. Omilos was closed when I was there as its only open during the high season. However, this gourmet restaurant is in the same building that many of the world’s most famous people have frequented. From The Beatles and the Rolling Stones to Bridget Bardot and Jackie Kennedy, many people have been to this location that was formerly known as Lagoudera. They used to dock their yachts on the side of the restaurant and come in for a meal and a drink on the terrace. 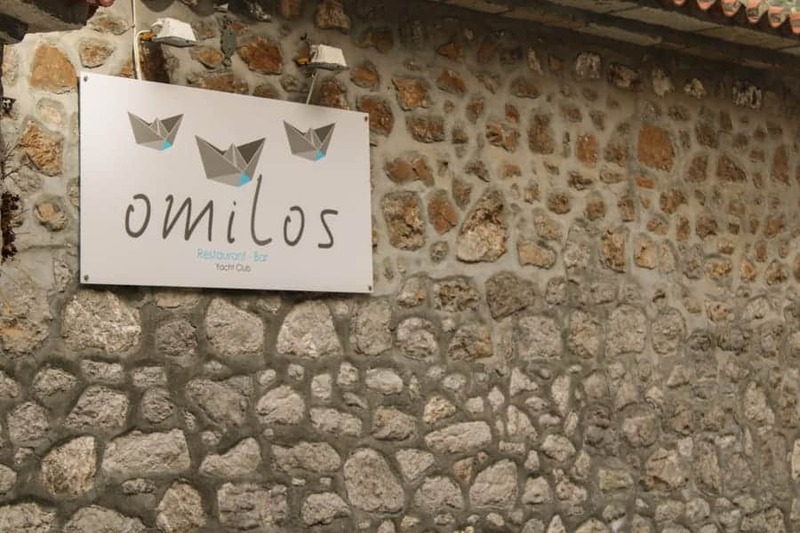 Omilos aims to keep this vibe alive and provides outstanding service to which those same stars would recognize. Hi, my name is Megan and I am addicted to ice cream (yea, I may actually be). Therefore, I pretty much was stoked when I saw The Cool Mule after disembarking from the ferry. The cafe and ice cream shop has a variety of flavors available and you can get a scoop (or four) in a bowl or waffle cone. Along with ice cream, they sell a range of pastries and drinks of all temperatures. 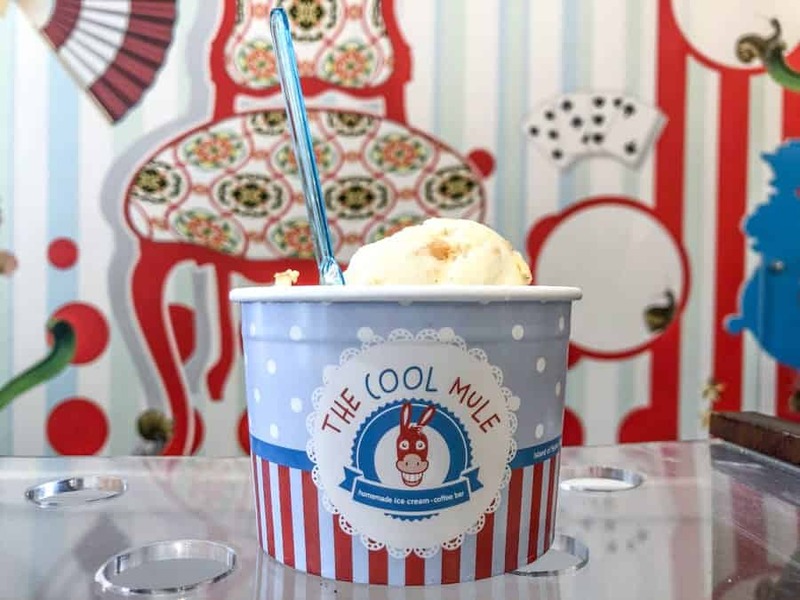 Another advantage is that they are one of the first places to open on Hydra Island, so if you need some breakfast food or a coffee early in the morning, you might find that The Cool Mule is your only option. Bandera is a lovely little café located directly on the harbor. I spent my mornings here as it is one of the first places to open and has excellent wifi. They serve coffee, cold drinks, and food over a large space indoors. They also have a really large terrace out front. I didn’t eat any of the food there, so I cannot vouch for it, but the place is great for an early morning coffee or to take a break from a day of exploring. Papagalos quickly became my favorite place to take a break on the island. And by ‘break’, I mean spending relentless hours on this blog (and other projects affiliated with it). I am not entirely sure if it was the chilled out atmosphere, the music, or the fact that when it got a bit chilly outside it was seemingly the only place willing to put some heating on. I became a regular and the staff greeted me happily each time as I went up to my normal seat, upstairs by the window, to relax from the daily activities (ie. work). They also served a great breakfast which helped as my hotel didn’t provide breakfast and I am not sure I would have wanted to spend any more time than necessary in the hotel. Papagalos is open early enough although its suggested time of 9am didn’t seem to be quite right but was always open by 9.30am and closed late at night. Try their homemade ginger lemonade while sitting by the harbor in the sunshine. It was absolutely divine. 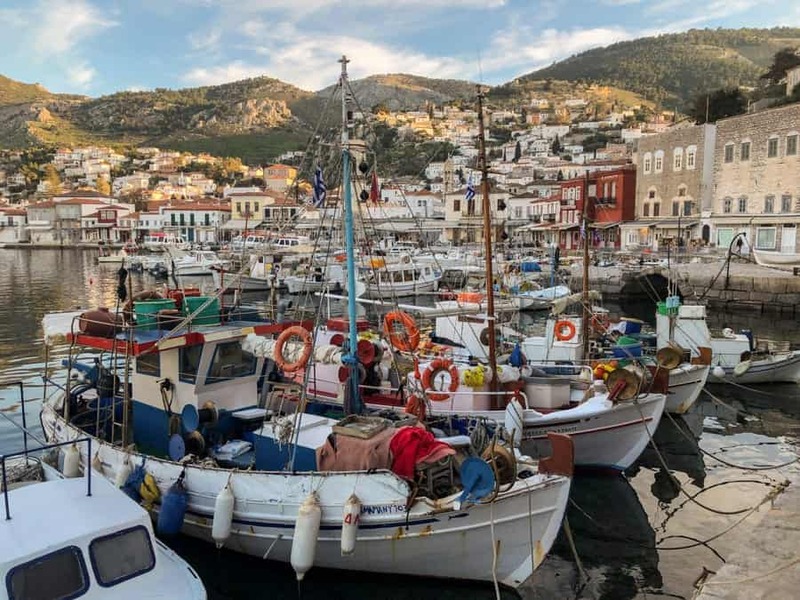 There is no central fish market in Hydra and the fisherman simply just pull-up to the harbor and turn their little boats into fresh-catch stalls displaying the fish they have landed. You will know when it’s time for the boats to come in as the many cats on the island will start to congregate on the harbor’s edge, eagerly waiting for the boats to arrive. The boats’ arrivals will be announced by flocks of seagulls noisily circle above the boats waiting to get any of the spoils that are thrown into the sea. 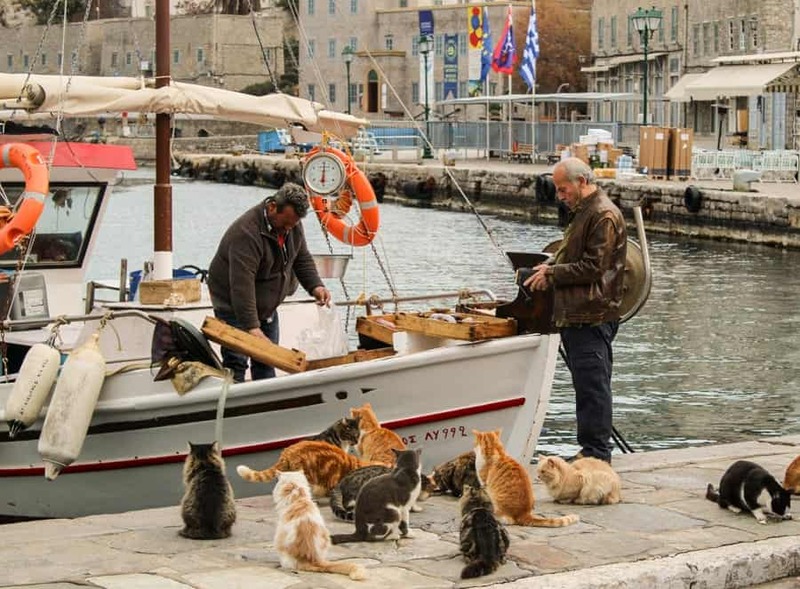 The cats will provide you with plenty of amusement as they sit by the boats meowing loudly. I have never seen anything as routine and habitual as these cats waiting on their morning feeding. If you are facing out to sea on the left-hand side of the town, there is a large hill with the Greek flag flying high at the top of it. I attempted to reach the flag twice and was only somewhat successful the second time… but both times I thoroughly enjoyed my time exploring the winding streets and little viewing points along the way. When I finally reached the top ridge of the hill, I was close to the flag but not quite daring enough to reach the flag as I didn’t really have the appropriate footwear on (standard) and I lost my nerve a little. Nevertheless, it was a nice little climb for someone as out of shape as I am. To get there, head toward the end of the harbor and take the steep white steps up the hill. Keep heading up until you reach a t-junction and take the right. Then take the first set of stairs going up on the left and continue climbing them. Parts of the walk will look like you are going to someone’s house but eventually, you will reach the top. There might be an easier way of doing this, but I didn’t find it. The sheer number of steps and how steep they are is fairly tough on the knees and if you have limited mobility, it is inadvisable to attempt this climb. The viewing platforms provide great rest breaks for some water and to allow your knees to recover. Once at the top of the hill, the views are stunning you will enjoy a panoramic view of the harbor and views of the town sprawling up into the hill. The greatest part of this walk is that throughout the whole thing, I was alone and could look down on the harbor which was brimming with eager and curious tourists coming off of the cruise ships. 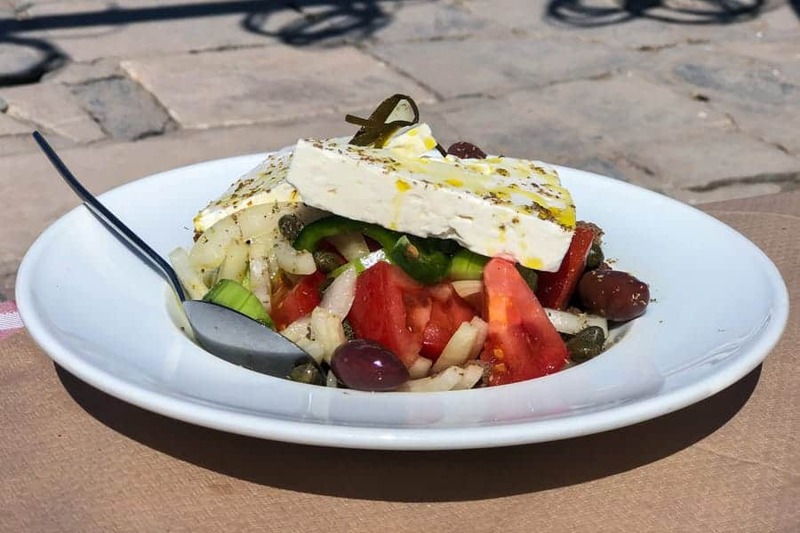 There are many things to do in Hydra that don’t involve loads of other people if you wish to be alone… this is one of those things. As I stated before, my first attempt at getting to the top of the hill was a bit of a bust but I managed to find a vantage point about two-thirds of the way up the hill to look over the city. But, this failed attempt led me to realize that Hydra town was beautiful and had many back streets so I decided to go and get lost in them. 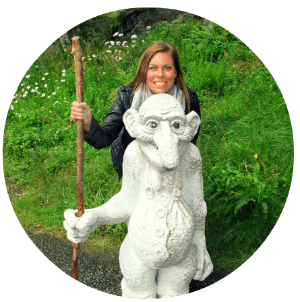 The towns streets are like a little maze and I was quickly aware there was very little chance I was going to be able to retrace my steps back, so I decided that I would follow the town up and over the hill and walk back down to the sea. Not entirely sure where I would end up and woefully ill-prepared for a long walk, I continued following the streets up. Along the way, I stopped at a very local little market to grab some refreshments and a snack and then carried on. The back streets are full of wonderful little taverns which seemed far more local than the extremely touristy harbor. Over the white washed walls, lemon trees hung providing a nice flash of color. And in one house, a donkey peered over the wall to see who was passing by. I eventually reached the top of the town and could see the sea below and took the route down the hill toward the little harbor of Kamini. The back streets were also fairly void of other tourists apart from one couple seeking the old church and another who looked to be in the middle of a fight. Once I reached the harbor, it was a little bit livelier as there was a great looking restaurant perched over the sea and was pretty busy. 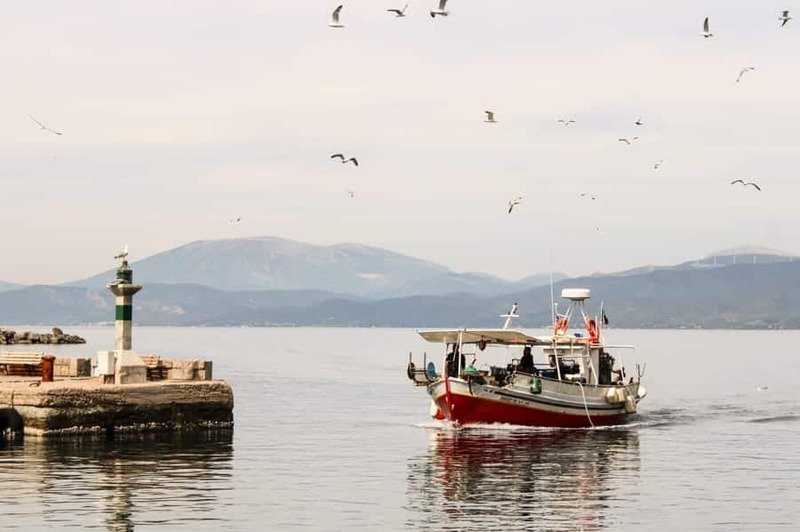 As you approach the harbor, there is a red derelict building, which used to be a taverna frequented by the late singer Leonard Cohen who lived on the island in the 1960s. 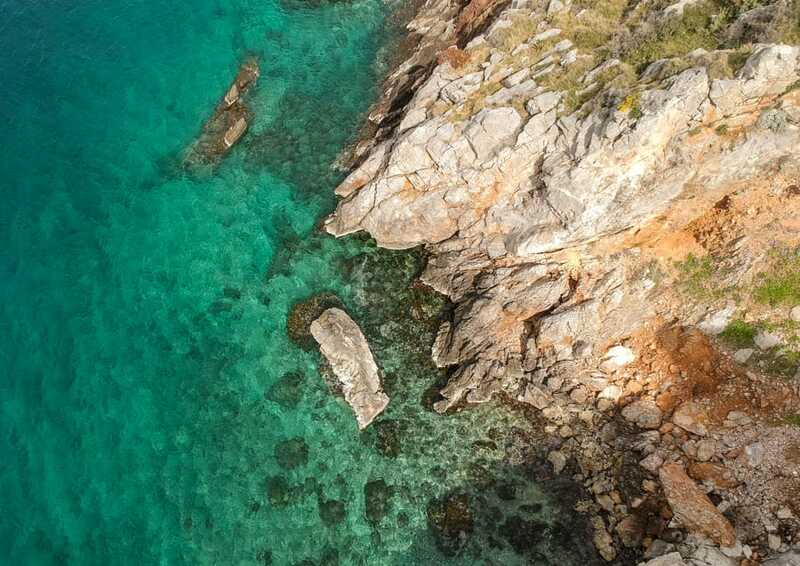 I chose to carry on along the coast away from Hydra to photograph the harbor from a different perspective and check out a small beach that was hidden in a cove. 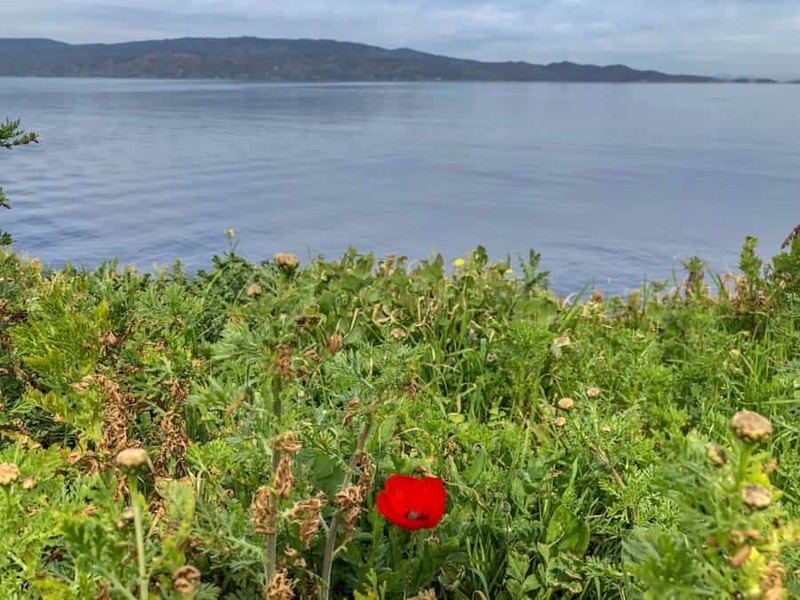 I then turned back and walked the coastal path back to Hydra enjoying looking out over the sea and marveling at how the sea could be such vibrant colors on this small island close to Athens. 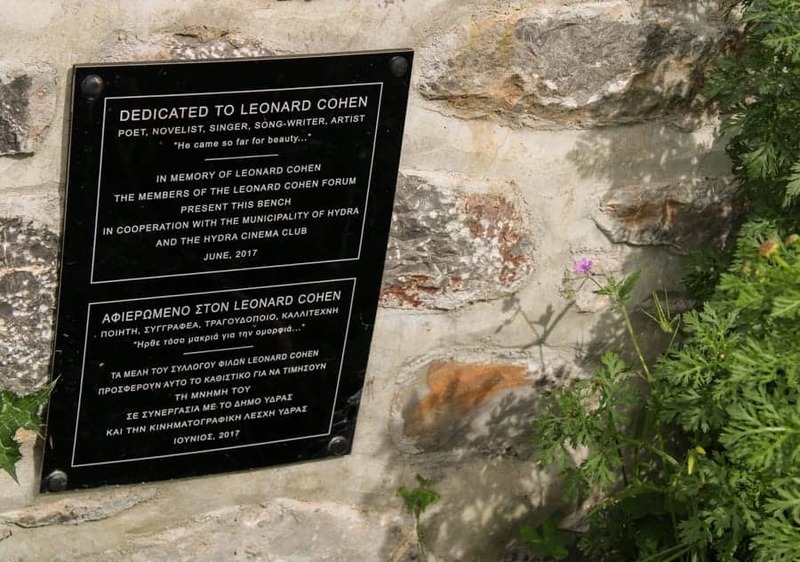 Canadian-born musician Leonard Cohen was a one-time resident of Hydra and had spent his time writing while living on the island back in the 60s. 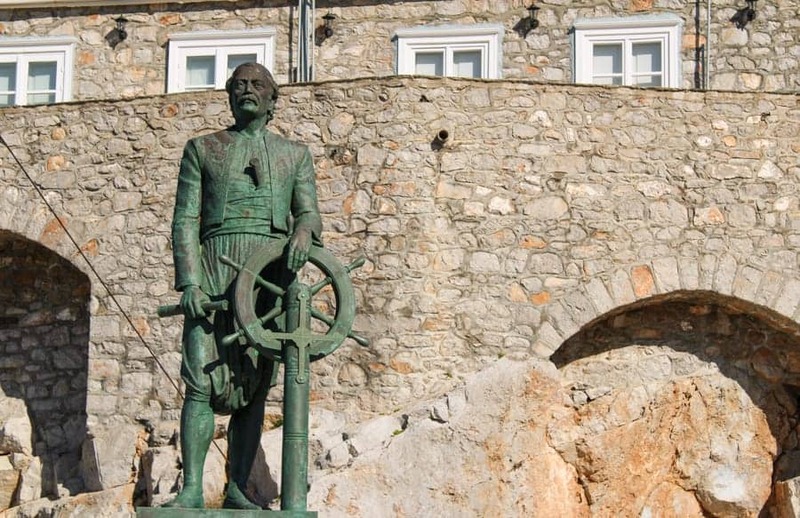 His life had a great impact on Hydra Island and the Islanders hold a special place in their hearts for him. They had crowd-funded to have a bench built in his honor for his 80th birthday. Unfortunately, he died before turning 80 and the bench instead became a memorial to him. It is a simple stone bench looking over the ocean with a wood back support. If you are not paying attention, you would honestly think nothing of it. But, if you notice it and take a few moments to sit there and you will realize the simplistic beauty it provides. I had heard about the bench earlier in the day from an American couple I met while watching the cats by the harbor. 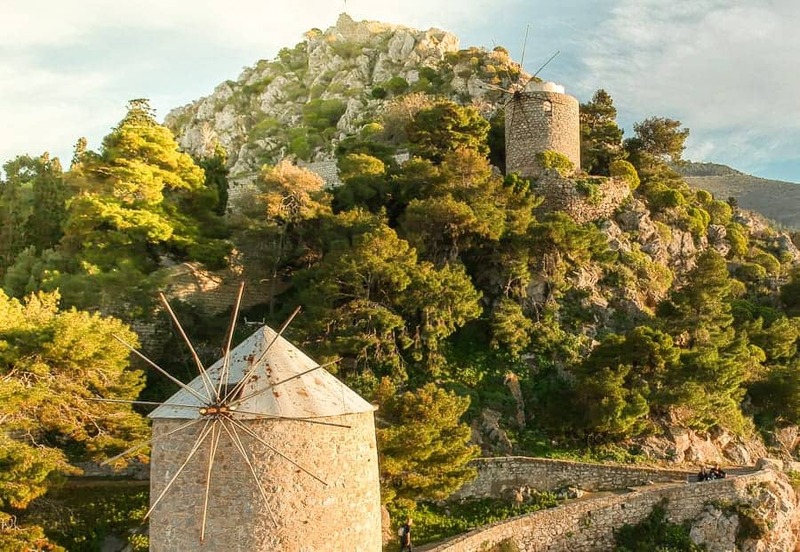 They had said it was a worthwhile place to visit on Hydra and interesting as it’s something you wouldn’t expect to find on a small Greek island. As I walked back from my walk through the back streets, I noticed the couple sitting on a bench and stopped to say hello. They told me to look at the side of the bench and low and behold, it was Leonard Cohen’s Bench. It was the perfect setting for a bench in his memory as you could easily sit there for hours looking over the Mediterranean losing yourself in your thoughts and finding creative inspiration. To find the bench, head out of the harbor on the left-hand side. If you are facing the ocean and follow the coastal path around the coast, you will find it along the route. Keep an eye out as it is easy to miss. The sunset in Hydra provides a spectacular golden hour that bathes the right side (if you are facing out to sea) of the harbor in a golden light. I arrived in Hydra just before sunset and after checking in to my hotel I went for a short walk to photograph the windmills on the left-hand side of the harbor. On the way back, I was taken aback with how golden the opposite side had become. Hydras central location on the island makes it a great location to start a hike along the coast in either direction. The paths are marked out with yellow and black signs that detail where you will go if you take the hike. I touched a bit on both sides of the island, but in reality, didn’t have the time to afford to hike to the end of each trail (I probably would have died anyway from my terrible shape). If you head out of the harbor to the right, you will follow a coastal path that ends at a light house on the end of the island. If you head the other direction out of Hydra, you will hike along the coast and into the hills to a small church called Church of Agia Marina. This little blue and white church is picturesque in the hills of the island and is one of the best things to do in Hydra. 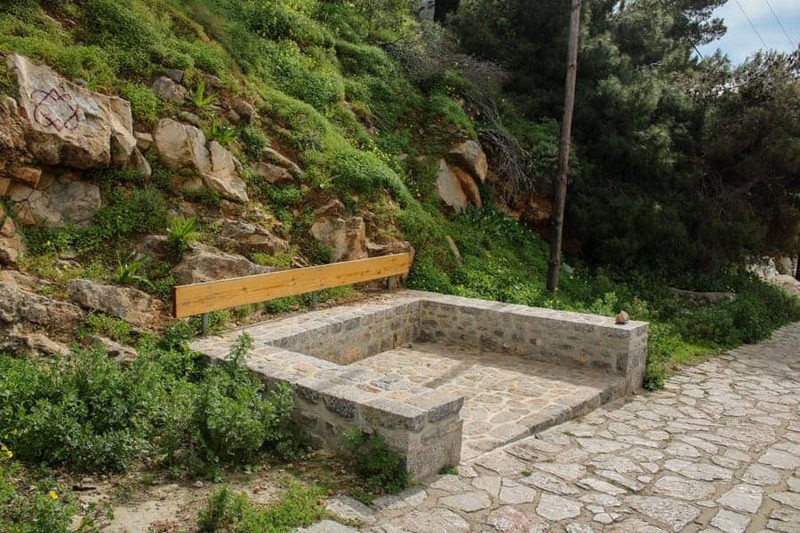 There are many other hikes in Hydra and following trails will take you to new, undiscovered places. Do remember that there are no cars on Hydra and to ensure your well-being is in a decent enough state to make the hike back to Hydra. 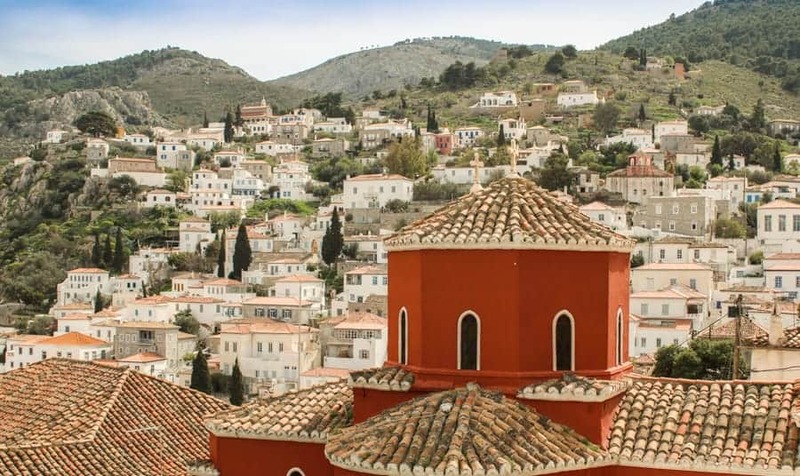 In the center of Hydra sits a large watch tower with a church and museum behind it. To be honest, I didn’t actually go into the museum, but I walked into the courtyard and admired the building. As you go into the courtyard, there are three wooden doors to enter the church on the left. Behind one of the doors are big golden shrines where people lay valuable items such as gold or diamond rings to say thank you for miracles happening in their lives. Inside the church, you cannot take any photos, but in the museum on the right side of the courtyard, there are plenty of relics you are permitted to photograph. Be sure to be dressed appropriately for entering an Orthodox Church. 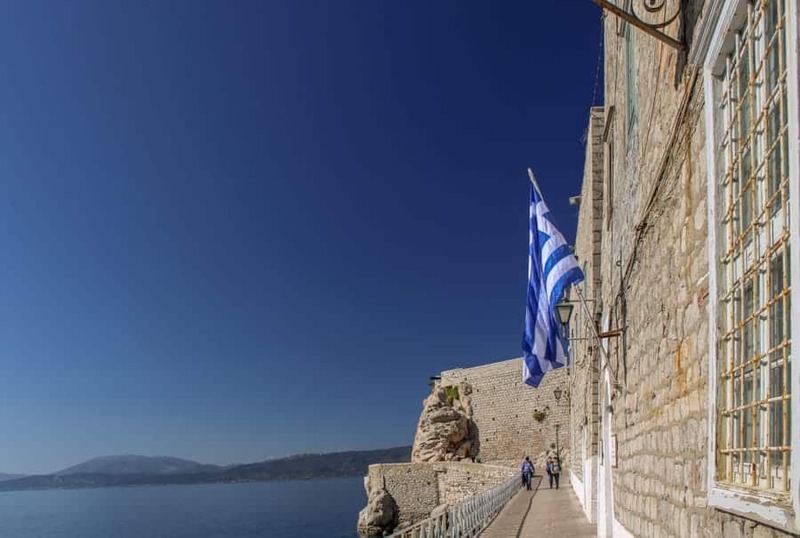 Located next to where the ferries and cruise ships dock is the Museum of Hydra which contains a complete history of the island, which played and incredibly important role in the Greek War of Independence (along with Spetses). The Museum contains many important historical artifacts from various wars, along with written archives detailing much of the island’s history. It is well worth spending a few hours exploring the museum if you’re a history buff. There are plenty of beaches dotted around the island, although some of these are only accessible by boat or via a hike. The weather was not beach-going weather when I was there. 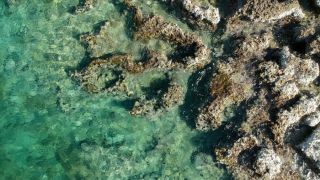 The beaches on the island are a mixture of sand or pebbles, however, the sea is consistently crystal clear and has an amazing turquoise color. 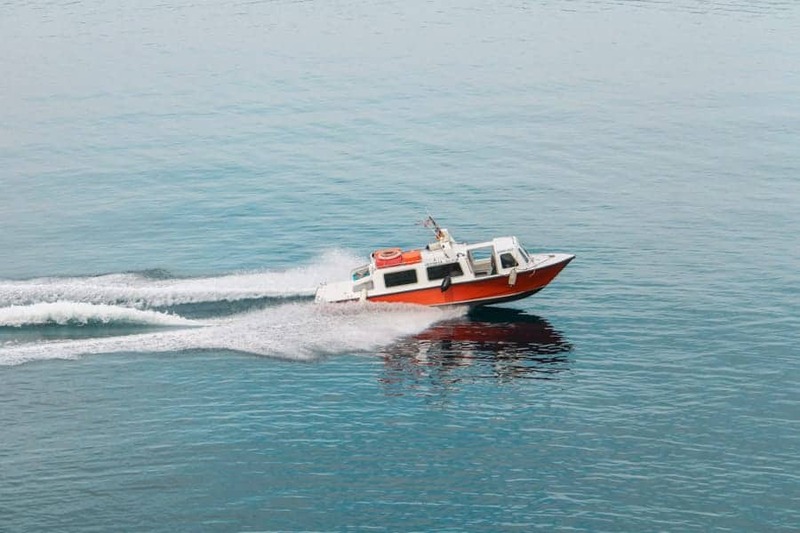 There are multiple ways to reach the beaches, including lovely coastal walks, water taxis, or miniature boats. The small boats depart from the harbor opposite the watch tower regularly. Kamini Beach is around 1.4 kilometers west of the main town of Hydra and can be reached by walking over the hill through the town while exploring the backstreets. Alternatively, you can take the coastal road and swing by and take a break at Leonard Cohen’s Bench. It is also possible to take a water taxi or small boat from Hydra to the little harbor of Kamini. Once you reach the beach, you will need to take the stairs down to the shoreline. Located by the beach is Castello Restaurant which is in a former armory that has been restored. On the beach during the summer months, there are sun loungers that can be rented from the restaurant. The lower part of the beach is public and you can set yourself up there without incurring a charge. Visiting Kamini Beach is one of the best things to do in Hydra. Vlychos Beach is relatively large compared to the rest of the beaches on Hydra but, like most of the other beaches, it’s pebbly with amazing crystal-clear water. It is located further along the coastal road than Kamini Beach to the west of Hydra. There is also a regular boat service to the beach along with the possibility of taking a water taxi. Once you are at the beach, you will find beach parasols and beds that can be rented or you can set up your own space. There are two tavernas by the beach selling delicious food along with a mini market that sells various refreshments. On the opposite side of Hydra, there is a secluded beach that is only accessible by a boat called Saint Nicholas Beach. This hidden, white-sanded beach is a small bit of paradise on Hydra and only really an option for those who are actually staying on Hydra Island for a few nights as day-trippers will struggle to get there and back in time. Once there, you will find a taverna selling great food and cocktails to help you relax for the day. The high cliffs of the cove shelter the beach from the wind and keeps the water calm. There are several other little beaches around Hydra which are a short walk from the town center. Spila, although technically not a beach, is a little area to relax just outside of the town below the sunset bar. 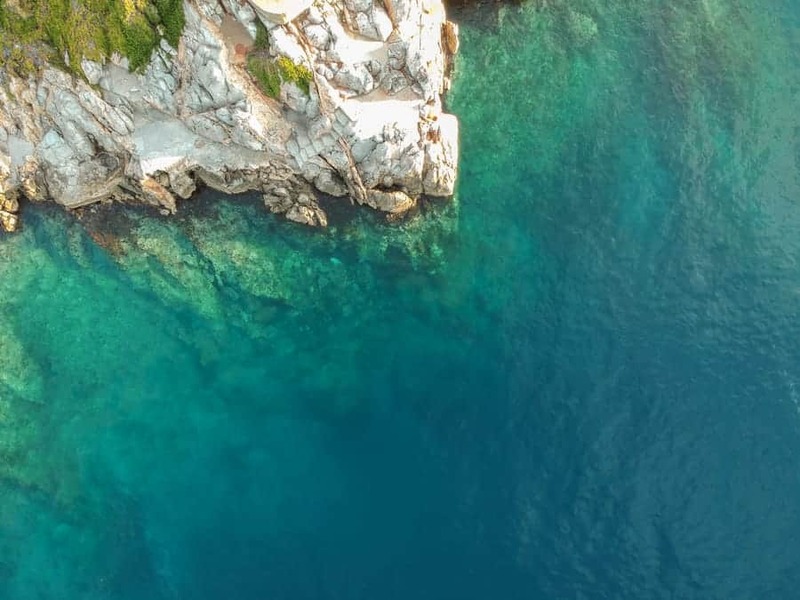 It has been designed so that people can relax and enjoy a dip in the sea diving off of the rocks. Plakes Vlychos Beach is part of the Four Seasons and a great beach to chill out at. The beach is 3 kilometers away from the town center and is accessible by walking or by boat. 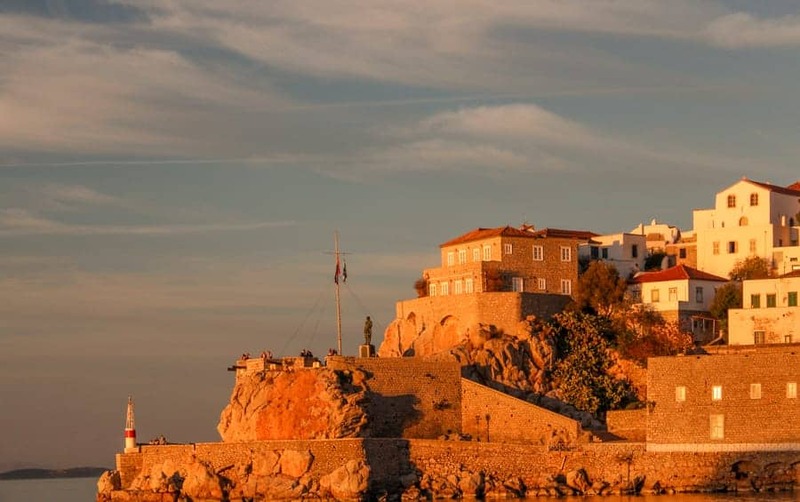 If you are wanting to escape the crowds, you can see the rates for the Hydra Four Season here. When I was in Hydra, I stayed at the Amaryllis Guesthouse located really centrally in the town. While the place was nice enough, it wasn’t a place I would book again. 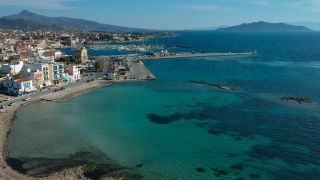 But, it was affordable and after amazing stays on Spetses and Aegina, I couldn’t complain that much. 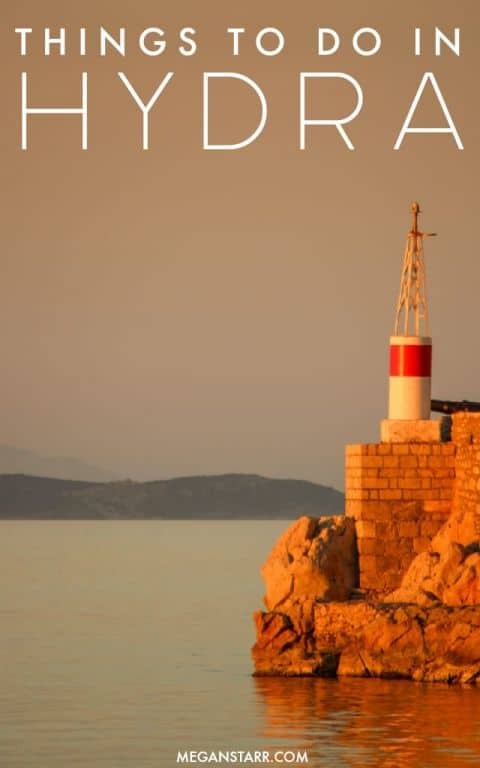 There are SO many other stellar options of places to stay in Hydra, so you shouldn’t have an issue finding a great place to call home when there. Hydra was the island I needed on this trip after having been to two islands prior (Spetses and Aegina) and needed a relaxing break from. 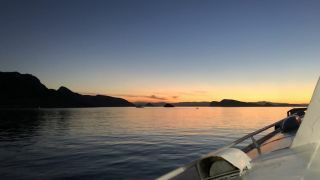 The life on the island was really suited to my travel style and I just loved the place and found many things to do in Hydra. The island, with its complete lack of any form of motorized vehicle, provided the escape from the modern world that I think everyone needs once in a while, yet allowed me to be connected enough to get urgent work done.